Anyone who has ever watched a television debate between religious and secular views (or followed such a discussion on social media) will have noticed the number of believers being quoted, to bolster a faith-based position. Recently, Michael Nugent participated in a radio debate on Newstalk about The Angelus. The host, George Hook, repeatedly referred to the large number of Catholics as a justification for retaining this intrusion of a particular religious denomination, into what should be a neutral environment provided by the national broadcaster. This is a familiar refrain. As an apostate from Christianity and an opponent of many Catholic doctrines, I would very much prefer if my name in a Baptismal Register was not used to argue for such dogma. I had previously attempted to leave the Church in 2010 using the www.countmeout.ie service but I was too late. That service had become unavailable after the Catholic Church changed Canon Law, to make defection based on that methodology impossible. So recently I tried again. I live in the Diocese of Clogher and so at first I wrote to Bishop Liam McDaid. With a few personal details obfuscated, the following is representative of the initial correspondence. I was born on DD-MM-YYYY and I was baptised as a Roman Catholic at Saint Michael the Archangel Church (in Andersonstown, Belfast) during this same year. I was raised by devout parents as an observant Catholic and before attending university, I had a Catholic education at Roman Catholic schools. In 2010, I attempted to formally defect from the Catholic Church but I was informed that Canon Law had been changed to make this impossible. 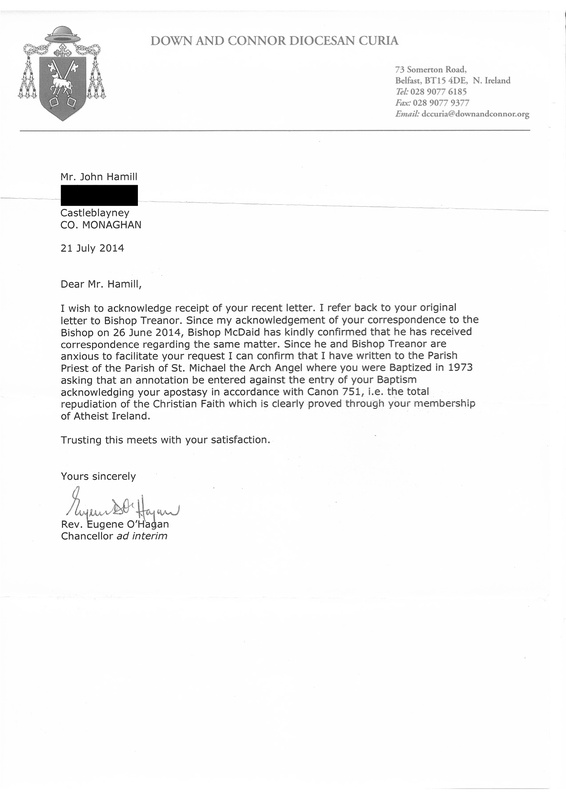 Since then, I have joined Atheist Ireland and I have been an active member of the organisation. I help campaign for ethical secularism and I seek to publicly promote atheism at every opportunity. For your information, I’ve attached some of my recent published articles in this role. 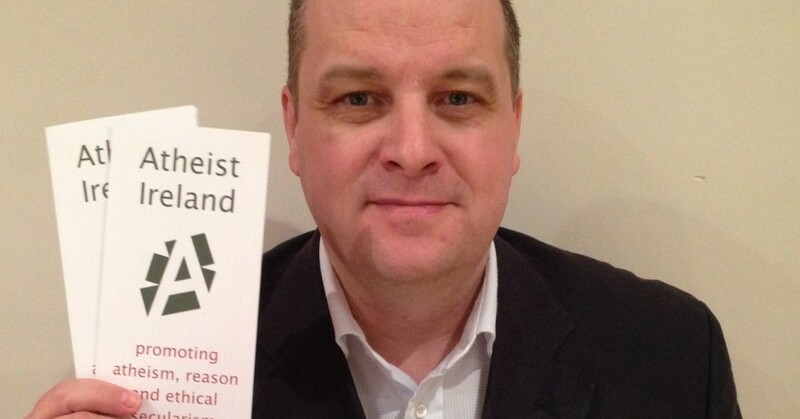 My intention is to continue public advocacy of atheism and to grow the membership of the Atheist Ireland organisation. According to Canon 1364, I believe that as an apostate from the faith I may be granted latae sententiae excommunication. I would be very grateful if you could confirm my excommunication from the Roman Catholic Church for me in writing. I don’t believe that either myself or your Church would be well served by the continuing pretence of my membership. Bishop McDaid replied to suggest that I should instead contact the parish where I was baptised. When I wrote to Saint Michael the Archangel parish, in the Diocese of Down and Connor, I also contacted Bishop Noel Treanor. There followed some further correspondence towards both bishops as each directed me to the other. While I did point out to their Excellencies that a reticence in applying sanctions is not what I recall of the clergy I encountered at school, I don’t believe that either Bishop was being obstructive or evasive. Rather, it seems that Canon Law does not make it easy for the institution to facilitate the process I had requested. In parallel to this correspondence, I was also directed through a series of priests who were responsible for implementing Canon Law on behalf of the parish where I was baptised. These were variously clergy working locally in the parish, priests in the curia within the diocesan office and also in Armagh. Throughout this process, the basis on which decisions were being taken was not obvious. However, as best I could make out, latae sentential excommunication describes a situation whereby a person effectively excommunicates themselves from the Roman Catholic Church through their actions. The penalty of excommunication automatically follows and apostasy is one of the actions that incurs latae sentential excommunication. This is described in Canon 1364. Without prejudice to the prescript of Canon 194, an apostate from the faith, a heretic or a schismatic incurs a latae sentential excommunication; in addition, a cleric can be punished with the penalties mentioned in Canon 1336. An apostate, as opposed to a heretic or a schismatic, is defined in Canon 751. Heresy is the obstinate denial or obstinate doubt after the reception of baptism of some truth which is to be believed by divine and Catholic faith; apostasy is the total repudiation of the Christian faith; schism is the refusal of submission to the Supreme Pontiff or of communion with members of the Church subject to him. As I understand it, the requirement to qualify for latae sentential excommunication is not simply that a person should state that they are an apostate. This is treated as being indicative of ephemeral doubts. Rather, a person must prove that their apostasy has had a specific impact on their life. In my own case, it seems that my membership of Atheist Ireland was sufficient to prove my apostasy, allowing me to formally leave the Roman Catholic Church. I then received the letter at the link below at the end of this process and I’m very grateful to all of the clergy that I engaged with. While the procedure seemed lengthy and convoluted, all of the individual priests that I corresponded with were scrupulously polite and always responded to my queries and requests promptly. Thanks for letting me know, the link is working now. John, thank you for the excellent footwork that you have done here. Now there is a definite model for anyone else to follow. I must get off my arse and get myself out as well. I’m trying for my excommunication as well. My research though does have some conflicting information on where I send my defection apostate letter. Some say to the Roman Catholic church I was baptized and confirmed in others say the parish closest to me. Have you any information on that? George Hook is very much in favor of the Angelus as it is a reminder for listeners at 6pm to turn over to his program. Hi John, great to see you in the Sunday Times today and a welcome surprise to find we have like minds when it comes to religion. Keep up the good work. Great reading. Congratulations on gaining your freedom & outlining the pioneering work. Regretfully I never took the opportunity to ‘exit’ myself when there was a chance to do so during a short time living in Switzerland. It is a relatively straight-forward process there as well as in Germany & Austria. What a long-winded palava in this country. What can I do, where can I go, whom can I approach? Particularly at this point in time when I happen to be back in my old ‘parish’. While I do not align myself to an atheistic view of the world, I respect other peoples’ right to hold religious beliefs or none. Excellent piece of information- thanks for sharing your story. I intend doing exactly the same myself. Just need to ask my mum where was I baptised- my memory of almost 50 years ago is a bit hazy; especially seeming as i was only a few months old at the time! Great article, but did you get your bell, book and candle? How can I apply to be excommunicated from the catholic church? Born and baptised in Galway City, I will consider it a great honor. Will having an abortion in London when I was 23 suffice or will I have to stick my tongue out at our lady’s statue in the protestant church as the nuns told us in the Mercy Convent primary school? I’m sure you could punch the Pope, but he’d probably forgive you. Thanks for sharing your story John. Just last year I wrote a similar letter to my old parish priest. Unfortunately there was radio silence form his end. I Managed to get in touch with the bishop and was able to add my intention to defect to my baptismal records too.